I am linking up with Farley @ Oh’ Boy Fourth Grade for her Currently linky party. LISTENING: My family has been watching the Olympics. Isn’t everyone watching them? 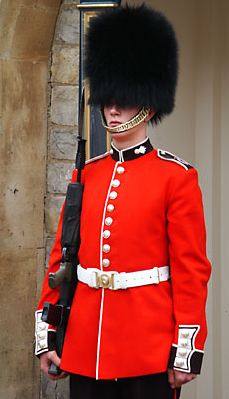 Now my daughter has decided that our next vacation should be spent in London. She’s even been looking up colleges to attend over there. Keep in mind she’s 12, so she may change her mind in the next few years. LOVING: I love, love, love flipflops. I don’t know how many pairs I have, but it never seems like I have enough. THINKING: Our dishwasher has been on the fritz this week. UGH! I know women all across America used to wash dishes by hand. But, I’m always a little nervous about germs when I wash by hand. 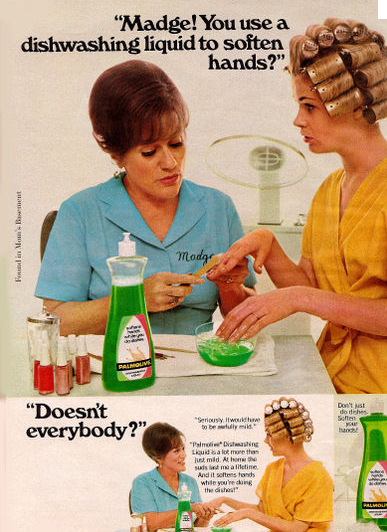 Remember the old Palmolive commercial with Madge? I now see why women had dishwashing hands. WANTING: I love, love, love to read books. I just finished reading Private Games which takes place in London during the Olympics. It seemed to be an appropriate book to read this week. I read a book every 2 or 3 days so you can just imagine how much money I spend on books each year. I occasionally go to the library. Most of the time I visit two different used book store so I can trade in my old ones. My “finished reading” book basket is full so it’s time to go turn them in and get new ones. NEEDING: I am the co-chair of the teacher appreciation committee at my daughter’s middle school. I think the best way to a teacher’s heart is through her/his stomach. So, each month my committee provides food for our beloved teachers. We try to be thematic when possible. In September, we had sliced apples and apple dip. Parent-teacher conferences were held in October so we provided food the first three days of conference week. We had a salad bar one day, nacho bar another day, and heavy appetizers the last day. Based on the compliments we received, I think this was their favorite food event last year. At the end of the year, we gave the teachers a recipe book full of the recipes they had sampled at our fun food fests. 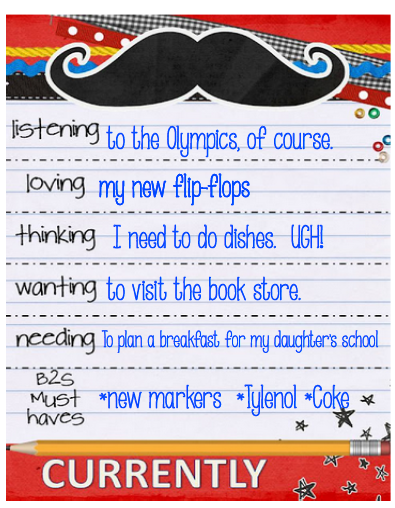 B2S MUST HAVES: B2S stands for Back to School. There are 3 things I think are absolutely essential to begin the year. *Mr. Sketch markers are the best markers, hands down! I love the smell and the tip keeps its shape. *Tylenol should be on every teacher’s shopping list. I’ve always heard that teachers get varicose veins and UTIs more than other professions. I think headaches should also be added to that list. *Coke is my drink of choice for caffeine. You can choose whatever source of caffeine you want for your shopping list. Even if you’re not a big caffeine drinker, I would keep a “in case of emergency break glass” can or bottle of something in your closet at school. It’s better to be prepared. What are your B2S must haves? Private games is on my shelf to read. I don't think I realized it was set during the olympics. It might need to be my next read. I just finished the book I was reading. I've been reading a ton this summer too. I have library books, kindle books and then books I got at our local used bookstore. I think I might be a book hoarder. I'm one of your newest followers. I would love it if you would check my blog out. And, I am liking the Taffy Apple Dip recipe, yum!!! Guess I need to check out this James Patterson book…. oh, all the things I need/want and just need to do!